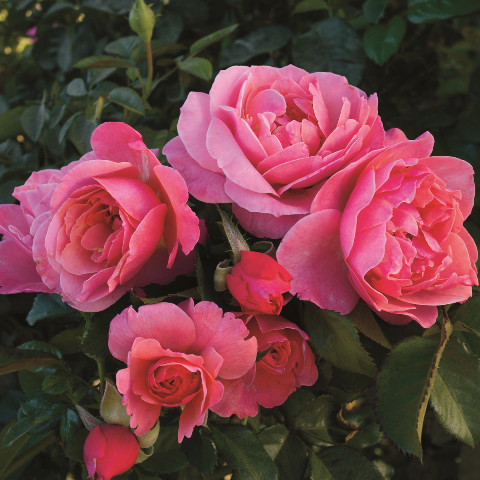 The new introductions for 2017 feature some truly "eye-catching" rosebushes. The beauty and color blends of their "bloom smiles" are enticingly attractive to behold! To start, there is a beautiful climbing rose named Tropical Lightning (ORAlodsem) hybridized by Pierre Orard and introduced by Weeks Roses. The blooms are described as a smoked orange with cream stripes. Glossy green foliage with good disease resistance really makes this climber stand out. The moderate apple-like fragrance is a divine pleasure to thrill the senses. 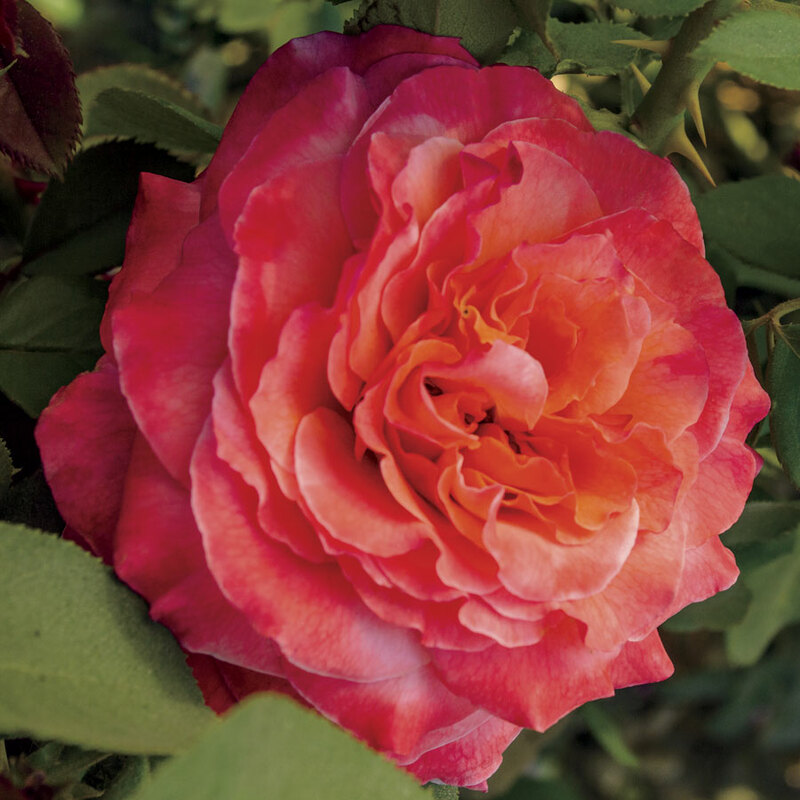 This rose holds a fantastic "wow factor" for any rose bed or landscape area. Add an ornate trellis for this rosebush to climb and you instantly have an awesome setting that will bring out the raves of those visiting your gardens! 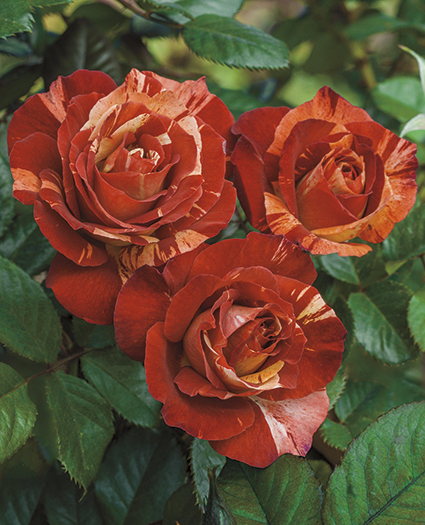 Speaking of "wow factor" roses, we must take a look at the new floribunda rose named Spice It Up™ (JACspisee) from Jackson & Perkins. Her blooms are a blend of orange, apricot and coral pink. To witness her beautiful clusters of bloom smiles in any garden setting is sure to stir one's emotions. As with many such eye-catching roses, her nicely blended colors draw you in for another look while her rich fragrance holds you there as your mind fills with appreciation and joy. Spice It Up™ is a child of the rose Victorian Spice and has beautiful dark green foliage that helps to show off her beautiful blooms. Next on our list is a gorgeous mini-climber from Weeks Roses named Cupid's Kisses™ (WEKtriscala, T802-2). 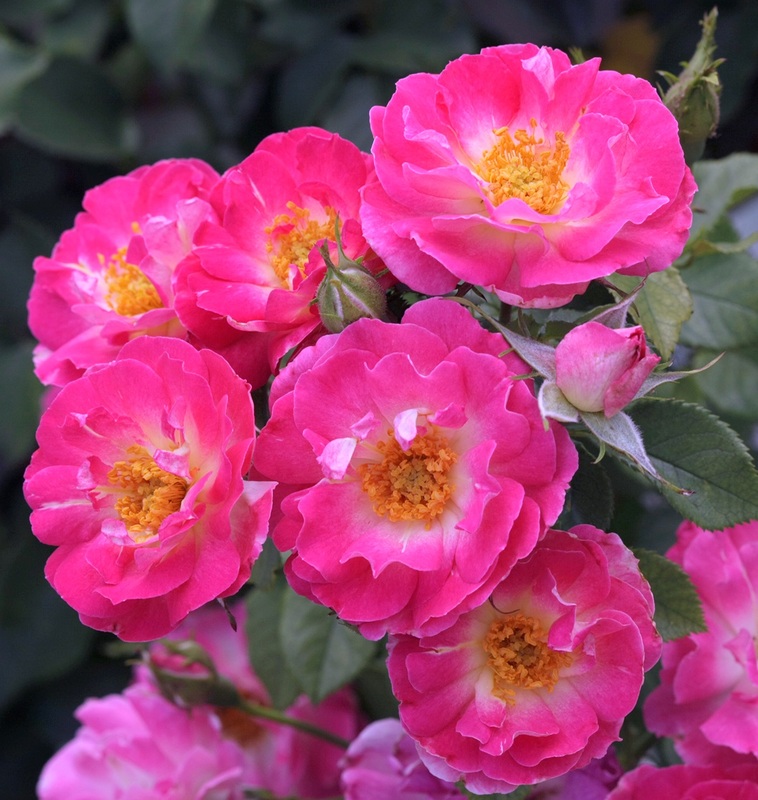 This rosebush features beautiful clusters of cerise pink blooms with a white eye. Hybridizer Christian Bedard must be pleased indeed with this fine rosebush; a loving kiss of moderate fruity fragrance adds a nice touch of charm to the blooms' beauty. The name is right on the money as well, as the flowers are like a special kiss of honest love. Add a nice ornate trellis and an eye-catching centerpiece for your garden or rose bed you shall have. Yet another fine floribunda rose for 2017 from Jackson & Perkins is named Surreal™ (JAChabsun). It is a child of Tahitian Sunset and does an amazing job of having all the rich colors of a gorgeous sunset blended into each of her plentiful "bloom smiles." The rich colors warm one's heart to be sure. Her ruffled bloom smiles with a refreshing fragrance add to the sincere charm this eye-catching rosebush holds. Her disease resistance is listed as being very good too, thus a real plus for our rose beds. All photos of the rose blooms in the article have been provided by the fine folks at Weeks Roses and Jackson & Perkins Roses. Thank you to each of them.